Normandy Life: Mosaic Monday # 22. A favourite location to photograph. Mosaic Monday # 22. A favourite location to photograph. One task I really dislike doing is trawling through the zillions of photographs on my PC hitting the delete button. I always get sidetracked, reminiscing about times, places and friends captured by my point and shoot. I can spend ages marvelling at all the wonderful places we've seen when what I should really be doing is ruthlessly discarding the blurred snaps, out of focus arty shots and those inadvertent captures of my foot or hand that just happened to get into the frame! But needs must as they say and so during a quiet afternoon recently I sat down to do just that. What I discovered in the process is that one of my most favourite locations to photograph would seem to be the beaches of Normandy. I wonder if you have a favourite location that you return to over and over again, one that changes with the tide, the season or even the time of day? The water and beaches around here often feature in my photos, too, Maggie. And I fully empathize with how difficult it is to click that delete button. 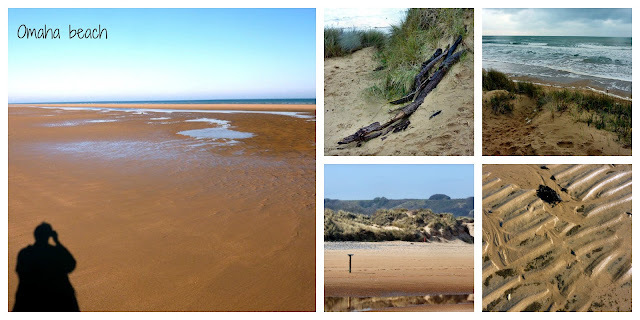 On our visit to Normandy this past summer, I enjoyed my glimpse of the Normandy beaches and can see how they would attract you over and over again. Thanks for hosting MM. Have a great week. Wonderful views & photos Maggie. I often walk by a river near by with my camera. The scenery there changes according to seasons and it is peaceful and quiet. That is my 2nd favourite, 1st is my garden. Ahhhh..the beaches of Normandy...what stories they could tell! My son visited them after he graduated form college and enjoyed a narrated tour about their role in WW!!. thanks most sincerely for hosting me today and for sharing your always so lovely shots ! Your photos are wonderful - you've captured the light and colour of the sand beautifully. 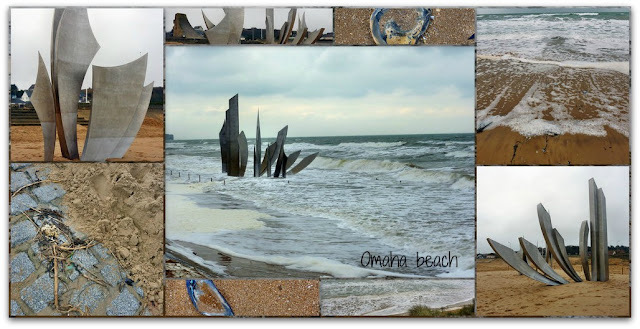 We "did' the beaches of Normandy in December 2003, on our trip from New Zealand to meet our first granddaughter. My husband is a history buff and wanted to spend more time there but all I wanted to do was get in the car and drive across France to the little village in Burgundy where my daughter, husband and baby Zoé were waiting for us! Thank you Maggie as always for hosting and for the beautiful travelogue here today. I too love a quiet and peaceful beach. We are always drawn to the water.... rivers, marshes, lakes, oceans....and my pictures( the keepers and the ones I delete) reflect that. I feel your pain on that deleting task. The joy and the sorrow of digital photograp: the ability to take zillions of photographs. What an amazing sculpture on the beach, I know I would be going back there for sure. One of our favourite places is also beside the water, so many water fowl and changes with the water. Enjoy the week. My first time at your meme, and what lovely photos and mosaics here! Thank you for hosting, I look forward to seeing more wonderful mosaics. That really looks like a nice place to visit again and again. I and my hubby love to keep visiting the mountains, which we actually do every year, summer or autumn. I never get tired hiking the trails, sleeping in a tent and taking lots of pictures. Thanks for hosting. Have a wonderful week! When we lived close to the beach my favorite place to take photos was there with the waves and the tides and the sea birds. These photos of your are lovely. Happy new week to you and thanks so much for hosting! Glorious photos - no wonder that is a favorite place. I guess my favorite is more of a subject than a specific place - I think Great Blue Heron's are my favorite - and I find them all over - in fields, rivers, the bay, trees - lovely chances for just one more shot - especially if the light is just perfect. Thank you for the wonderful beach photos.Thank you too for hosting Mosaic Monday 22. Always, a pleasure to visit and join in. I love the beach to and just get to the ocean as much as I would like. Road trip here we come!! Happy New Year, Maggie! I need to take a whole week to go through my photos and get them in order...and delete MANY of them. Like you, I do the same thing...I go through them and find myself reminiscing and get nothing done...lol! I can certainly understand why this is your favorite place to take pics...it is absolutely glorious! Enjoy your week! Beautiful - Normandy is one of the places on my bucket list. I'm always happy when you post from this spot, partly because it brings back personal memories and partly because we must never forget what happened there. It's a daunting tasks to be sure - never easy to purge anything! Thank you so much for hosting Mosaic Monday, Maggie. It's fun to be joining in the fun this week. Neat pictures! Your narrative inspired me to make a mosaic of a place on Skyline Drive where I go frequently. Often I see deer there. I am impressed that you look through your photos and delete them, it is a task I must do, and has been on my list for several years. Perhaps I should enjoy the reminiscing, make some mosaics to share on Mondays and then press delete and I will be multi tasking then! Lovely to see your photos! Hello Margie,Perhaps one day I will get visit the beaches of Normandy. Here, my favorite things to photograph are the flowers in the garden, especially macro shots. Sundance the palomino is fun, but most fun are the grandchildren. I do have some favorite landscapes, the San Fransisco Bridge that I photographed in the '80s and Stonehenge that where I visited in 2001 and again in '06. Not because they are such glorious photos, but because I was so fortunate to get to visit Stonehenge. And I do agree that it is such a chore to glean the photos that we have taken all year. I can see why you love the beaches of Normandy. For me anywhere I can photograph wildflowers is a winner!